Zimbabwe: Egyptair to return to Harare? According to various aviation websites, Egypt's flag carrier, Egyptair, will make its return to Zimbabwe after a 9 year halt in 2013. From 01 June 2013 the airline is extending its existing 4x weekly service between Cairo <> Dar Es Salaam to Harare on board a Boeing 737-800 aircraft. Currently reservation for this flight is not available, and GDS (global distribution system) timetable listing is only displaying oneway flight. We'll keep you posted! Ethiopia's flag carrier and Star Alliance member, Ethiopian Airlines, will launch flights to Ndola in Zambia and Blantyre (via Lilongwe) in Malawi. The airline is planning to start operating flights to its two new destinations in Africa on 31 March 2013. The two new routes are replacing the existing Addis Ababa - Lubumbashi - Lilongwe - Addis Ababa routing. Botswana's flag carrier, Air Botswana, has postponed the launch dates of three planned new routes and cancelled two further routes. The launch date for the new routes was initially planned for 28 Oct 2012. (see "Air Botswana to launch flights to new destinations in Southern Africa" 26 Sept 2012). The airline canceled its Gaborone <> Lilongwe (Malawi) service as well as its flights from Gaborone via Harare (Zimbabwe) to Blantyre in Malawi. Air Botswana will start operating flights on the Gaborone - Harare - Nairobi route on 31 March 2013 and from Gaborone to Lanseria International Airport in Johannesburg in South Africa on 03 April 2013. The City of Cape Town has released some impressive tourism statistics about Cape Town. According to the stats, over two million people have visited Cape Town’s six biggest attractions in November 2012 alone. Furthermore, all of Cape Town's so-called "Big Six" icons reported growth on 2011’s November figures. Kirstenbosch Botanical Gardens visitor numbers, for instance, were up by more than 13% from last year. Cape Town, get ready for a superbusy rest of the season! 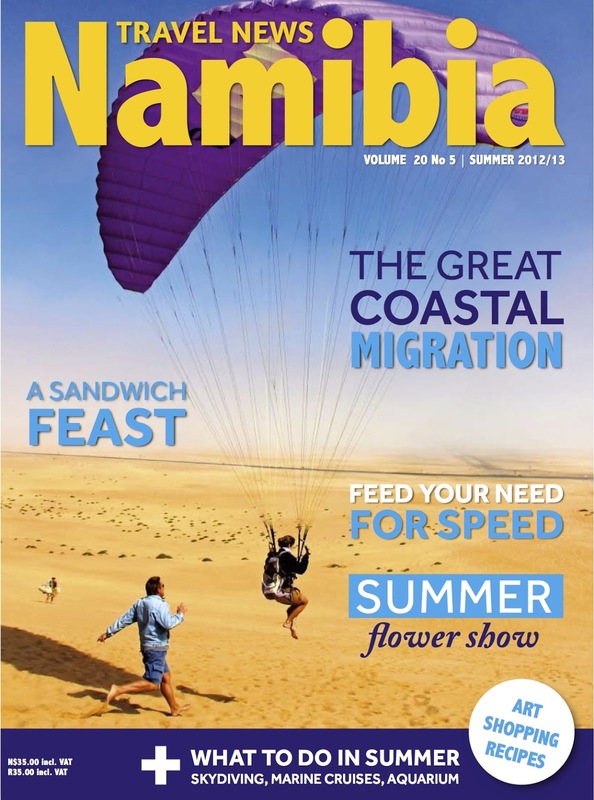 Venture Publications has released the Summer 2012/13 edition of "Travel News Namibia", a quarterly magazine about tourism in Namibia. The issue contains stories about the great coastal migration along Namibia's coastline, a trip to Sandwich Harbour, the town of Tsumeb near Etosha, the Lüderitz Speed Challenge in Lüderitz, information about the Desert Dash - the ultimate mountain biking challenge, and much more! Click here to download the pdf version of "Travel News Namibia (Vol. 20 No 5 | Summer 2012/13" for free. Swaziland, one of the world's last remaining absolute monarchies, is the smallest country in the southern hemisphere. Although it has only about the size of Wales, Swaziland contains of four separate geographical regions, which are running from North to South and are determined by altitude. 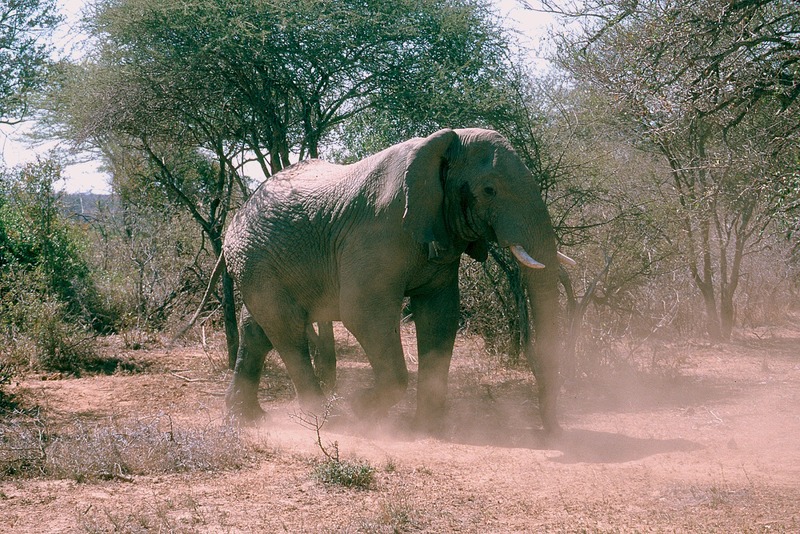 The landlocked country is therefore offering a wide variety of landscapes and some of southern Africa's most unique Game Reserves. Swaziland Tourism has recently compiled a short promotional video about the country's conservation areas, including the Hlane Royal National Park in the north-eastern Swazi bushveld, the Mkhaya Game Reserve in the country's southeast, the Mlilwane Wildlife Sanctuary in Swaziland's Ezulwini Valley as well as of Mlilwane's Reilly's Rock Hilltop Lodge and Sondzela Backpackers. Enjoy! According to the latest statistics released by the South African Department of Environmental Affairs (DEA), South Africa has lost 633 rhinos to illegal poaching since the beginning of 2012. Kruger National Park remains the hardest hit by poachers, having lost 395 rhinos since the beginning of this year. North West province has lost 77 rhinos to illegal poaching; KwaZulu-Natal and Limpopo have both lost 60 rhinos. Of the 266 arrested individuals in connection with rhino poaching, 237 are at the level of poacher, 18 are couriers and 11 are receivers. The Department of Environmental Affairs (DEA) has urged members of the public to report incidents of rhino poaching or any tip-offs that could lead to arrests and prevention of illegal killings to 0800 205 005. Some of the most popular reserves in the South African Lowveld's Panorama, namely the Blyde River Canyon Nature Reserve, Manyeleti Reserve, Loskop Dam Nature Reserve and the Songimvelo Game Reserve, will soon get a R44m facelift. Renovations at the Blyde River Canyon will start as soon as possible and will include Bourke's Luck Potholes, God's Window, "Drie/Three Rondawels" and Lowveld Views and River Falls. The Popa Falls Camp in Namibia's northern Kavango Region will soon receive a N$60 million facelift. The redevelopment of the camp is scheduled to be finished by December 2013 and will include brand-new conferencing facilities as well as facilities to offer game drives and boat cruises. It is also planned to move the camp site of the resort, which is currently in a flood-prone area, to a higher ground. The Popa Falls Camp, which is owned by Namibia Wildlife Resorts (NWR), is situated about 10 kilometres from Divundu in eastern Kavango. It is the ideal base from which to explore the Mahango Game Park, with over 450 species of birds recorded. South Africa's flag carrier, South African Airways (SAA), and Star Alliance member US Airways, based in Tempe (Arizona), signed a new bilateral code share agreement after receiving approval from the Department of Transport – South Africa and U.S. Department of Transportation. SAA's passengers will receive expanded access to and throughout the United States, along with the convenience of a single-ticket purchase. Conversely, customers traveling on US Airways will gain new access to destinations throughout South Africa and to Dakar, Senegal (subject to US Airways securing approval from Senegalese authorities). South African Airways' customers will have access to US Airways’ hub cities of Charlotte in North Carolina and Phoenix as well as various destinations within the United States. Equally, US Airways customers will have access to South African Airways' hub in Johannesburg as well as convenient connections to Cape Town, Durban, East London and Port Elizabeth in South Africa. Customers will also have access to Dakar, Senega,l via SAA's Washington <> Johannesburg service. All fights will be available for sale and for travel from 19 December 2012. South African National Parks (SANParks) announced on 13 Dec 2012 that for the 2013/14 tariff year annual increases in conservation fees will be higher than anticipated. According to Joep Stevens, SANParks General Manager: Strategic Tourism Services, this became unavoidable due to the provision of additional conservation functions such as additional security measures in parks such as Kruger National Park, Marakele National Park and Table Mountain National Park. Conservation fees will rise by 15%-25%, while the overall accommodation rates will increase by an average of 10,1%. SANParks will also adjust the accommodation rate structure to align with industry standards by introducing a low season rate, a shoulder season rate and a high season rate. These new rate changes will come into effect on 01 November 2013; bookings for November 2013 will open on 18 December 2012. 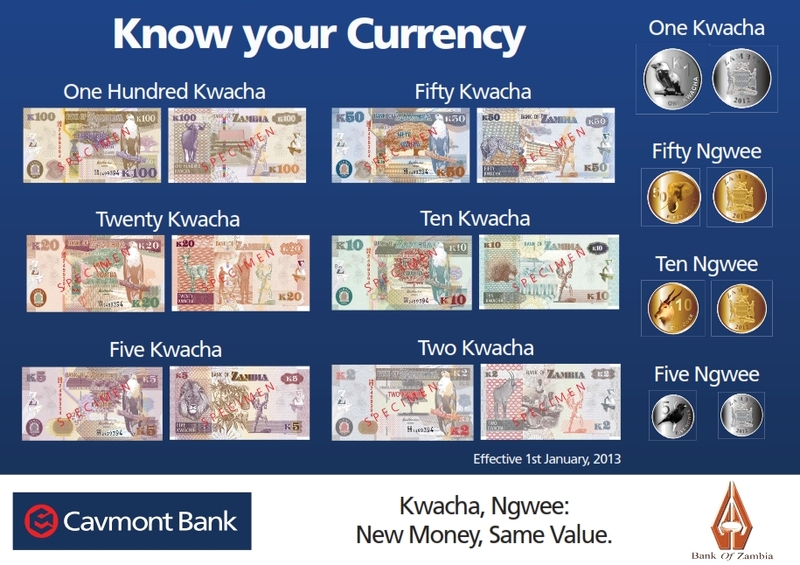 In January 2012 the Government of Zambia approved the recommendation of the Bank of Zambia (BOZ) Board to rebase the national currency, the Zambian Kwacha, by lopping off three zeros. The date for the actual changeover to the rebased currency and the introduction of new banknotes & coins is set to be 01 January 2013. 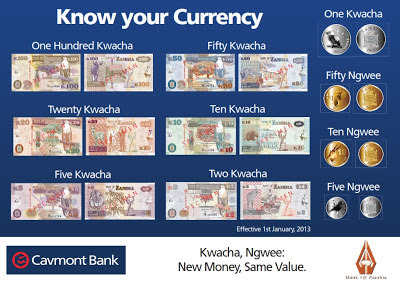 Zambia will replace the old notes and coins with new 100 Kwacha, 50 Kwacha, 20 Kwacha, 10 Kwacha, 5 Kwacha and 2 Kwacha banknotes, as well as 1 Kwacha, 50 Ngwee, 10 Ngwee and 5 Ngwee coins. The public in Zambia is given a six-month window in which people will be able to transact using the current and rebased notes after which transactions would only be done using rebased notes. If you are food lover and planning to visit Cape Town, make sure that you are going to be there on a Saturday. Wondering why? Well, every Saturday in the Cape Town neighborhood of Woodstock a revitalised Old Biscuit Mill complex hosts an superb farmers market called "Neighbourgoods". The market, like its counterpart in Braamfontein in Johannesburg, is offering farm fresh as well as organic foods, locally produced specialty goods, freshly cooked snacks and much more. Yum! Kudos "Roads & Kingdoms" for the video! Neighbourgoods Market Cape Town from Roads and Kingdoms on Vimeo. Video interviews: "What does Nelson Mandela mean to you?" Broadcaster Al Jazeera went to the streets of South Africa's business hub Johannesburg, home to people from across the world, and asked 10 South Africans and non-South Africans: "What does Nelson Mandela mean to you?" According to the latest statistics released by the South African Department of Environmental Affairs (DEA), South Africa has lost 618 rhinos to illegal poaching since the beginning of 2012. Kruger National Park remains the hardest hit by poachers, having lost 381 rhinos since the beginning of this year. North West province has lost 77 rhinos to illegal poaching; KwaZulu-Natal has lost 60 rhinos and Limpopo 59 rhinos. The total number of arrests in connection with the poaching totalled 257.
update (13 Dec 2012): According to an interview with a SANParks spokesperson on eNCA this morning, the enforcement of gate quotas at Kruger National Park gates will run until the end of school holidays in January 2013. Day visitors planning to visit the Kruger National Park during this festive season are reminded that gate quotas will be enforced. Day visitors are advised to make a pre-booking to secure their entry at the entrance gate. Day visitors who make a booking prior to their arrival are expected to pay a non-refundable deposit of R28 per adult and R14 per child. The amount is meant to secure the space so that they can be counted in the number that makes a daily quota at that particular gate. 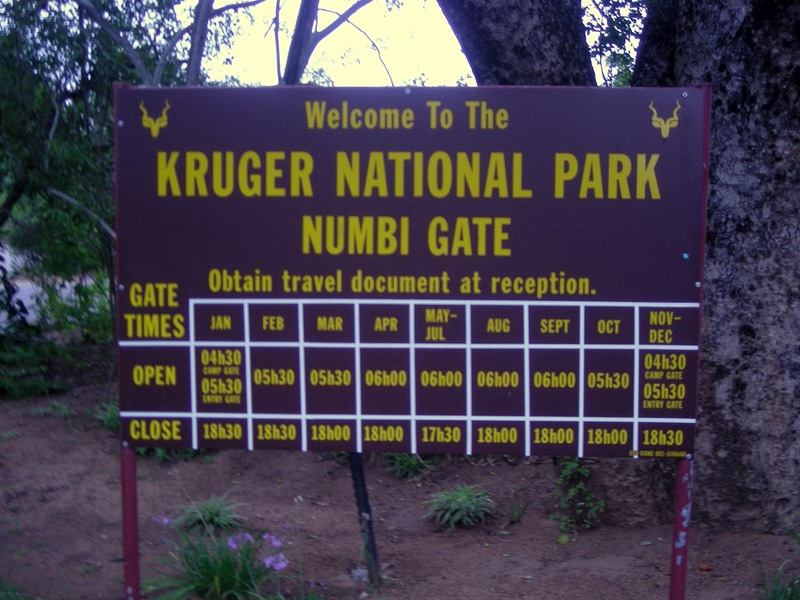 Kruger National Park uses gate quota system to control the influx of people coming in the park to avoid overcrowding. Once the daily quota has been reached, only people who made pre-bookings are allowed to enter. The rest will have to queue and rely on the people to move out of the park in order to create a space for them. However, this situation does not affect overnight visitors. All visitors should be able to produce their identity document or any alternative form of identification at the gates to avoid problems. Each gate has its own number of daily visitors allowed e.g. Kruger Gate is 750 people. Visitors to the Kruger National Park can gain access through one of the following gates: Crocodile Bridge, Malelane, Numbi, Phabeni, Kruger, Orpen, Phalaborwa, Punda Maria, Pafuri and Giriyondo. As part of a promotional campaign by South African Tourism, Australian chef and television presenter Neil Perry recently went on a so-called fine-dining safari across South Africa. He criss-crossed the country and visited Benny Masekwameng, Executive Chef at Southern Sun's MondoVino Restaurant in Johannesburg, prepared a traditional potjie at the Phinda Mountain Lodge in Zululand, had some outstanding wines at the Grande Provence estate in Franschoek, a chicken and prawn curry at the Oyster Box Hotel in Durban and the freshest seafood at the Ellerman House in Cape Town. Mouthwatering... Enjoy! I just stumbled on a promotional video about South Africa that I didn't know before. "The Bucket List" seems to be part of an interactive campaign South African Tourism is currently running in Australia, which encourages the Aussies to create and share their "Bucket List" of things to do in South Africa via a specially designed facebook app. The video below was made by One20 Video Productions from Melbourne (Australia) and produced for South African Tourism. Kudos at Will Hore of One20! The Bucket List from Will Horne on Vimeo. update (12 Dec 2012): Air Canada and South African Airways have signed a codeshare agreement. Effective 13 December 2012, customers connecting between the carriers in London or New York will be able to book a single itinerary and make seamless connections. In addition, as both airlines belong to the Star Alliance, customers can benefit from reciprocal frequent flier accumulation or redemption and lounge access for eligible customers. South African Airways will code share on Air Canada-operated flights between London and Vancouver, London and Toronto, and New York's John F. Kennedy International Airport and Toronto (including flights operated by Air Canada Express). Air Canada will in turn code share on South African Airways-operated services between London and Johannesburg, New York and Johannesburg, and Johannesburg and Cape Town. According to Airline Route, the flag carrier of Canada, Air Canada, and South African Airways have signed a reciprocal codeshare agreement effective from 13 December 2012. The planned codeshare routes will include Johannesburg <> Cape Town and Johannesburg <> London Heathrow (Air Canada operated by South African Airways) as well as London Heathrow <> Toronto and London Heathrow <> Vancouver (South African Airways operated by Air Canada). The two airlines are also planning to expand its codeshare operations to New York's John F. Kennedy International Airport and to Washington Dulles International Airport. Comair Limited, operator of British Airways in South Africa, will commence with scheduled services between Maputo International Airport in Mozambique's capital Maputo and O.R Tambo International Airport in Johannesburg in May 2013 on 06 May 2013. The airline will operate daily return flights with a double daily service on Tuesdays and Saturdays on board a Boeing 737-400 between the two destinatons. British Airways, operated by Comair Limited in South Africa, is a premium, full service airline operating over 400 flights per week in southern Africa which includes Johannesburg, Cape Town, Durban, Port Elizabeth, Harare, Victoria Falls, Livingstone, Windhoek and Mauritius. The N2 is South Africa's deadliest road! Mind the N2, travellers! No other road in South Africa is claiming more lifes than the N2 between East London and Mthatha in the country's Eastern Cape. According to the Road and Traffic Management Corporation (RTMC), an average of 90 people are getting killed in car crashes every year on that stretch of the N2. Further up the N2, between Mthatha and Kokstad, an average of 77 people are losing their lifes every year due to car accidents. Please don't skip the Transkei & the Wildcoast because of the statistics, just be super careful when driving along the N2! A while back we introduced you to the webshow "Africa on a plate", in which chef Lentswe Bhengu, a young and hip chef from South Africa, is exploring the wild & real culinary world of Africa. After a break of a couple of month, the makers of the series have uploaded two new episodes. Watch it now and get to learn how traditional African beer is brewed and what a Christmas chicken Cape Town style is like. Episode 1: Pan-fried Yellowtail or "Grilled fish in Houtbay"
Episode 3: How to cook a sheep's head or "Smileys in Langa"
btw - Africa on a Plate is a brand new startup asking for funds on their Indiegogo site. You can also follow them on Facebook and Twitter. Good luck guys! The De Zeekoe Guest Farm the first establishment in Oudtshoorn to be certified by the Fair Trade in Tourism South Africa (FTTSA). De Zeekoe is an owner-managed African farm that offers a variety of accommodation types, with both catered and self-catering options. The 2000-hectare bio-diversified farm, which puts a very strong focus on environmental conservation as well as community upliftment, is nestled between the majestic Swartberg and Outeniqua Mountains on the banks of the Olifants River. The De Zeekoe Guest Farm is located only 7 km from Oudtshoorn on the R328. The Fair Trade in Tourism South Africa (FTTSA) certification is an independent endorsement of fair and responsible tourism practice in South Africa. It is based on adherence to specific criteria including fair wages and working conditions, fair distribution of benefits, ethical business practice, and respect for human rights, culture and the environment. Certification is offered on a voluntary basis to providers of tourist accommodation, activities and attractions. The Rwanda Development Board (RDB) has published a press release (06 Dec 2012) reassuring tourists and the business community that it is safe to travel to all parts of Rwanda. According to the press release, the situation in the east of the DR Congo has resulted in two recent isolated skirmishes in Rwanda. Both incidents got rapidly contained and border security has been reinforced to prevent recurrence. update (01 July 2013): South African National Parks (SANParks) just announced on their facebook page, that the museum section of the Stevenson-Hamilton Knowledge Resource Centre at the Skukuza Restcamp in the Kruger National Park remains closed and will only re-open on 31 July 2013. The museum section of the Stevenson-Hamilton Knowledge Resource Centre at the Skukuza Restcamp in the Kruger National Park is undergoing a complete refurbishment and will therefore be closed from 05 Dec 2012 - 30 June 2013. The Stevenson-Hamilton Knowledge Resource Centre is one of the main attractions at the Skukuza Restcamp for visitors and researchers. The centre has a museum where the Kruger National Park's historic monuments are kept for public consumption and a library section with vast collection of reference materials. It hosts rich information on ecology, nature and conservation which assist in the management of the park. The library and its functions will not be affected by the refurbishment of the museum section. Skukuza Restcamp is the administrative headquarters, the main camp as well as the largest camp of the Kruger National Park. It is located on the southern banks of the Sabie River in the southern section of Kruger.